We believe that a professional tool is not necessarily a cumbersome one. That's why we have enhanced Smartcat with new capabilities allowing you to coordinate work on a translation project with the minimum of effort. The entire interaction between project managers and translators is now even more transparent. Clients can see the project cost, statistics, as well as the freelancers' performance online. A lack of transparency and the inability to track the current project stage is often an issue for translation clients. They prefer to be in the loop, but translators are often not happy with clients mailing them every half an hour asking: "Excuse me, but when will you get it done?" The Smartcat team has found a way to keep clients’ blood pressure in check without disturbing freelancers. 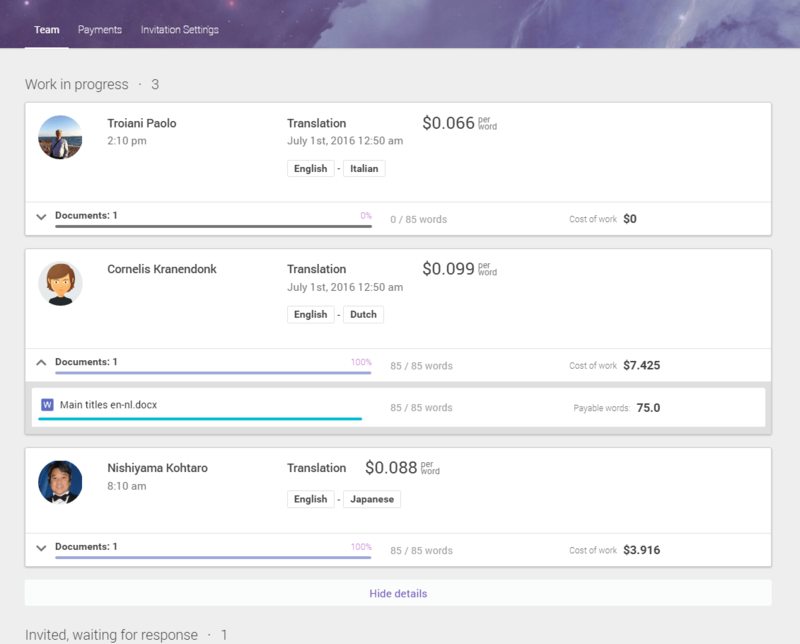 The project team page now shows personal progress bars for every freelancer. The client can track the performance of every freelancer online. The system shows how much has been translated and how much is left. Progress is calculated separately for every document. It is a quick aid to assessing the amount of work that has been completed and how much is left to be done. It is always nice to have everything you need displayed on one easily accessible page. The first tab contains data about freelancers and their performance. It shows who has been invited to work on the project, who accepted and who refused. 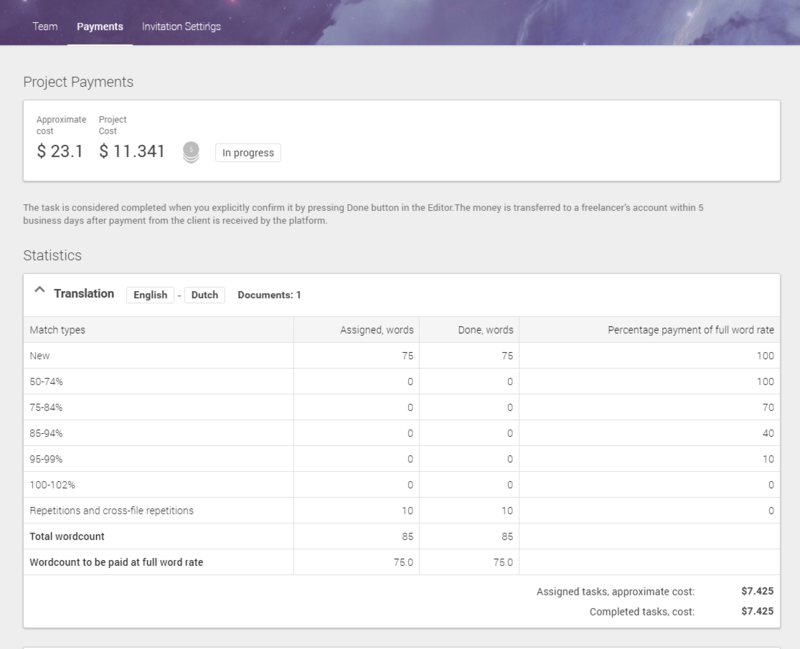 The section under the freelancer's avatar shows the type of documents he or she translates, their rates, language pair, and rating. 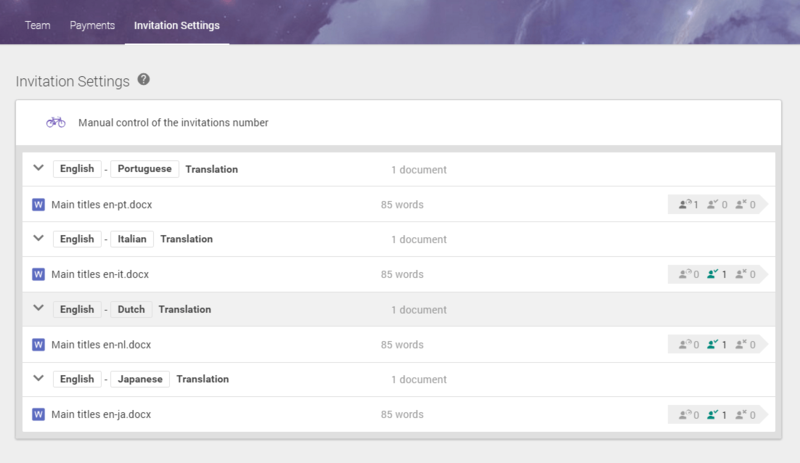 It also contains a progress bar showing the amount of work left the translator has left to do. You can also launch a chat with the translator from here. The second tab shows the project statistics and the final cost of translating all the documents. The third tab contains the settings for inviting freelancers to the project. If the client has just begun to gather translators for a project or has just received new content to translate, Smartcat supports the option of sending invitations to several freelancers in Turbo mode. The first one to accept it gets the job.